Kwentong Bayan Collective of Akin Lansdowne presents Balikbayan at the Workers Arts & Heritage Centre‎ (WAHC) from January 24 - April 21, 2018. 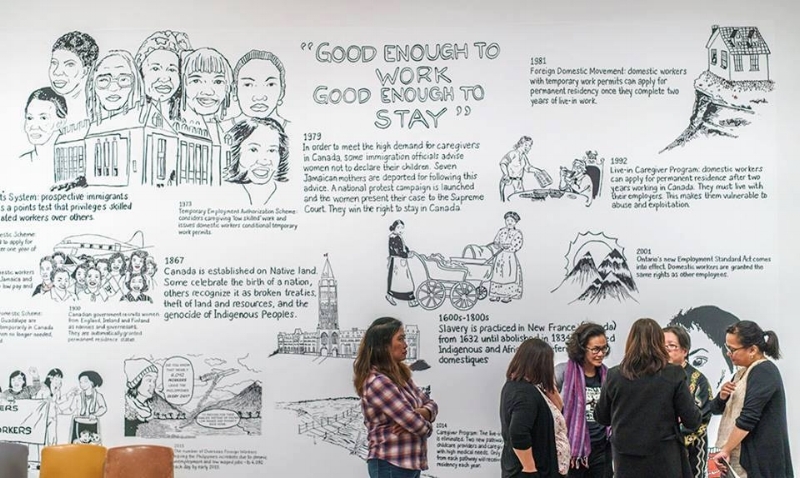 The exhibition Balikbayan features a visual timeline of the 150+ year history of caregiving in Canada by racialized women, and Balikbayan boxes that contain migration and labour stories. Opens to the public on January 24th, 2017. Join us for the opening reception on Friday, February 9th, 7 – 9 pm; artists will be in attendance. Learn more about the work of Kwentong Bayan with a slide talk and exhibition walkthrough conducted by Althea and Jo on Saturday February 10. Click here for more information. This exhibition will be accompanied by an exhibition essay by Zenee Maceda, Labour Activist and National Representative of the United Food and Commercial Workers (UFCW) Canada. The Workers Arts and Heritage Centre will also offer additional programming alongside BALIKBAYAN over the winter season, including two PA Day camps, a comic jam for ages 12 and up and much more. Click here for more information. Kwentong Bayan is a collective of two Toronto-based artists, Althea Balmes of Akin Lansdowne and Jo SiMalaya Alcampo. Their artistic mandate is to explore a critical and intersectional approach to community-based art, labour, and education. Althea Balmes is an artist-educator rooted in community work. She uses her strong connection to her culture and her place as a diasporic Canadian woman of colour to inspire her work and as a way to connect to others. Althea is pursuing a Master of Information degree in User Experience Design at the University of Toronto. Jo SiMalaya Alcampo is an interdisciplinary artist whose art practice includes community storytelling, interactive installations, and electroacoustic soundscapes. Jo volunteers with Caregiver Connections, Education and Support Organization (CCESO) – an organization that support migrant caregivers and is a member of the Kapwa Collective – a mutual support group of Filipinx Canadian artists, critical thinkers, and healers bridging narratives between the Indigenous and the Diasporic.